Over the years I have never completely dedicated any workshop specifically to the technology of mediation. Part of that reason is due to much of the the fanaticized and commercialized twist that has been applied to meditation. The tool of Meditation is often experienced in various stages. For some it is a topical experience creating a sense of wellbeing and calm, establishing balance in both mind and body. Some may take it a step further and claim to have out of this world experiences. In my first several attempts at meditation nothing spectacular happened. I had no idea what I was doing which I believe helped. However over time I broke through by nailing just the right breath that came along much like catching the right wave. This kind of meditation takes us beyond the firewall of our mind. We can see the backdrop, all potentials become very evident as we are no longer grounded in the reality stream limited to our general and predictable life/illusion. 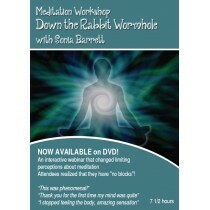 Every workshop or retreat I have done with Sonia Barrett has been like taking a magic elixir. I come away with renewed courage and excitement from which to play my characters in the game! I am not a guru follower or a person who gets swept away in the newest trend in consciousness studies, but Sonia is my Yoda. She has an amazing sense of humor and a deep intelligence that sees behind the veil. She offers her profound teachings in a grounded, realistic and completely fun and accessible manner. You get no bs or sales pitches for further study and absolutely no attitude of "guru worship". In a vast ocean of possible teachers from which to choose, I feel blessed to have found Sonia as my teacher! I´m Margarida from Lisbon, Portugal, psychotherapist, happy ... I attended the meditation webinar last weekend and enjoyed it very much. But I enjoyed you even more. I enjoy your relaxed way of being, your laughter,your way of not care less of what other people think about you. For me you are an example for what´s possible to achieve in terms of becoming the person I want and feels good to be, and not let what other people think stops me. The word that describes the last weekend powerful meditation webinar is allowing. Allowing what is, allowing me to be what I naturally am and allowing this powerful meditation helping me to achieve what I want in life. Thank you!